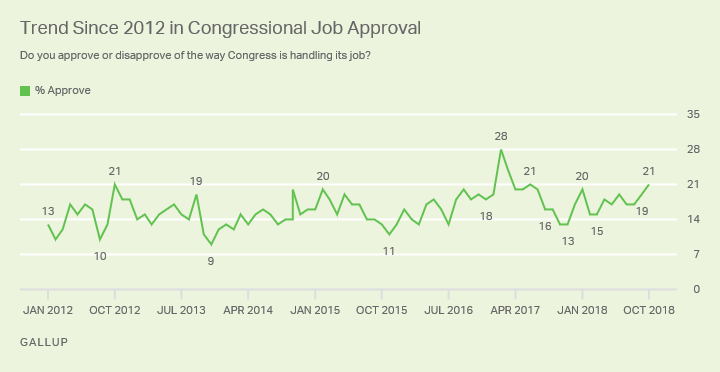 WASHINGTON, D.C. -- With less than a month to go until the midterm elections, Gallup finds 21% of U.S. adults approving and 73% disapproving of the way Congress is handling its job. The latest approval rating is similar to the 19% recorded last month, but is higher than the average 17% for the previous nine months of 2018. It is also the first time congressional approval has topped 20% since the early months of the Trump presidency. Before that, it had not reached this high since October 2012. The poll was conducted Oct. 1-10, as the Senate debated about and -- ultimately, on Oct. 6 -- confirmed Brett Kavanaugh to the Supreme Court by nearly a party-line vote. 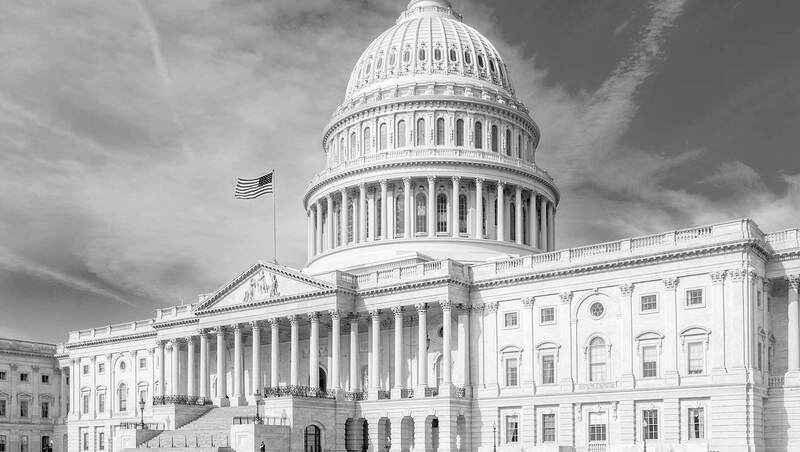 The job score for Congress was similar in both halves of the poll, suggesting the vote didn't immediately affect public views of the legislative body. Background: Most of the variation in congressional job approval over the past two years, since President Donald Trump took office, has been a result of changes among Republicans. Republicans were especially positive about the Republican-led Congress starting in February 2017 after Trump took office, as well as in January 2018, shortly after congressional passage of the Republican-sponsored tax overhaul bill. 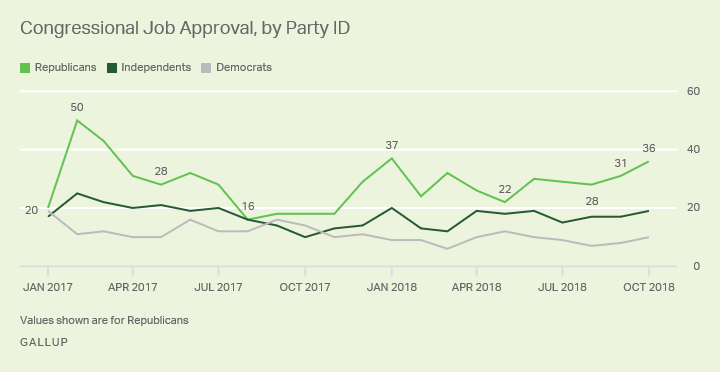 By contrast, Republicans' ratings of Congress plunged to 16% last summer after Congress failed to undo key elements of the Affordable Care Act. Even though the vast majority of Republicans wanted to see Kavanaugh confirmed, their views of Congress did not change appreciably between September and October, spanning his confirmation: 36% of Republicans now approve of the job Congress is doing, compared with 31% last month. However, Republicans are more positive than they were in August, possibly reflecting approval of the Senate Judiciary Committee's handling of Kavanaugh's confirmation process since Trump nominated him in July. Currently, 19% of independents and 10% of Democrats approve of the job Congress is doing, also similar to their ratings in September. Forty-five percent of Americans have a favorable view of the Republican Party, the party's highest rating in more than seven years. Democrats are at 44%. More Americans now have opinions about whether the Senate should confirm Brett Kavanaugh to the Supreme Court, but preferences remain divided overall.